If you have been studying English for some time now, you might know that pronouns can take the place of nouns. Pronouns are short words that can do everything that nouns can do. This free online intermediate English course will introduce you to reflexive pronouns and their correct usage. This will broaden your understanding of English grammar and help you to sound much more fluent in your next English conversation. This free online English course will first introduce you to reflexive pronouns, such as 'myself' and 'ourselves'. You will learn that sometimes reflexive pronouns are not necessary and that you can sometimes use other phrases to take their place. The course will also cover 'own' and 'self' and how they can be used in different ways but mean the same thing. You will study 'there' and 'it', and how to use other words such as modal verbs with 'there' and 'it' in order to provide extra information. You will then learn how to use 'some' and 'any' to talk about quantity as well as how to use 'some' for positives and 'any' for negatives. This grammar course will then teach you how to properly use 'without' with 'any' as well as show you the similarities between 'anybody' and 'nobody' and 'anyone'. Finally, you will cover the proper uses of 'somebody' and 'someone' as well as 'both', 'either' and 'neither'. 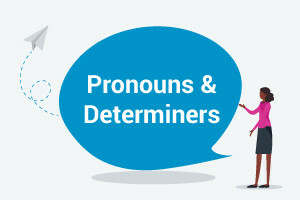 This intermediate level English Grammar course on pronouns and determiners is designed to be easy to understand and follow. Studying the different uses of pronouns in place of nouns will help you become more articulate when speaking the English language and forming sentences.The included audio recordings will also help you get used to the native English accent. So, check out the course and start enhancing your English grammar and listening skills today! Justify why we use reflexive pronouns, e.g. myself/ourselves etc. in sentences where the subject and the object are the same. Explain why there are certain sentences where reflexive pronouns are not necessary and we use other words/phrases instead. Relate how possessive pronouns mean something which belongs to someone and outline why singular words are often followed by plural words. Describe how the words 'own' and 'self' are used in sentences with a similar meaning and how 'both', 'either' and 'neither' refers to or compares two things. Relate how the words 'there' and 'it' are used as dummy subjects with the verb 'to be' - to give information about a noun and how 'there' refers to place.